We benchmark the hype, leaks, and fan hysteria surrounding the PC's next big CPU fight. Intel’s rumored “Ryzen-Killing” 5GHz Core i9-9900K and AMD’s rumored “Core i9-Killing” Ryzen 7 2800X aren’t official CPUs yet. But the slow drip of leaks and rumors surrounding the launch of the next big chip war has reached a full-on deluge. The leaks have gotten so bad, Amazon even posted a picture of the Intel part (which isn’t on sale yet) this week. We’re also now seeing more leaks of AMD’s highly anticipated Ryzen 7 2800X, expected to offer up to 10 cores on a 7nm process, running at up to 4.5GHz. In the spirit of unconfirmed rumors and leaks that feed on our deepest Fears Of Missing Out, we’ve conducted a completely fake and made-up showdown between the unannounced and possibly fake CPUs. All of our information comes from the Internet, so we guarantee it’s true. Our first test is LeakMark 2000. Unlike LeakMark 95, it measures only validated rumors, innuendo, and all-out stabs in the dark in both print and online media, as well as social media posts (including even Google+ and Friendster). Leaks on the Ryzen 7 2800X began with the launch of the Ryzen 7 2700X (reviewed here) but petered out more recently. 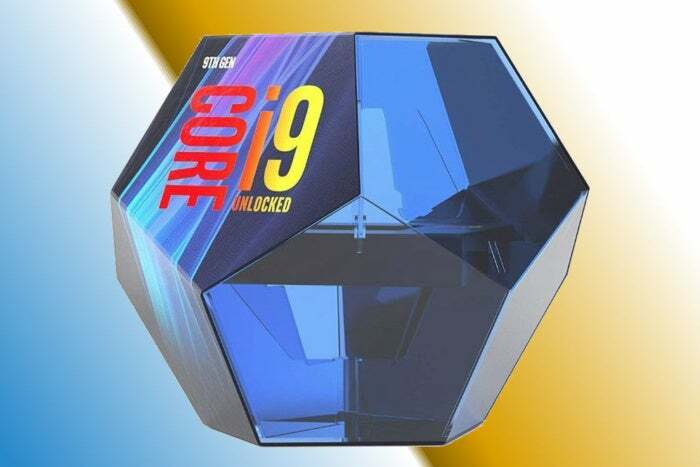 Intel’s Core i9-9900K, though, is off the charts. We counted no fewer than five different benchmarks of the rumored CPU. It’s almost as though the leaks are happening on purpose to drive a narrative. Hmmm. In LeakMark 2000, though, it’s clear the Core i9-9900K has surged ahead on leaks, which actually makes it worse, because companies usually don’t want leaks to leak. Unless, of course, they’re intentionally leaking. 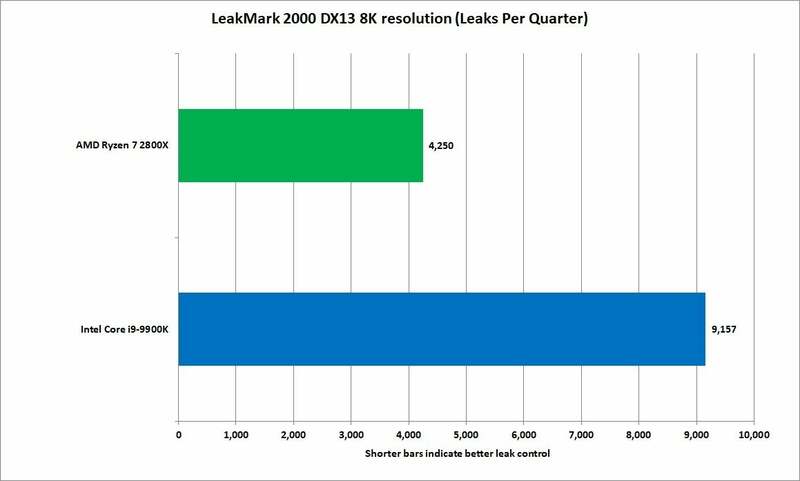 So, while the Core i9-9900K wins for more leaks, it loses for having more leaks. We think. LeakMark 2000 gauges leaks per quarter based on print and online news stories, social media posts, fortune cookie inserts, and bathroom stall essays. As you can tell from the name, the FanBoy Bandwidth benchmark is horribly behind the times, as there are FanGirls now, too. 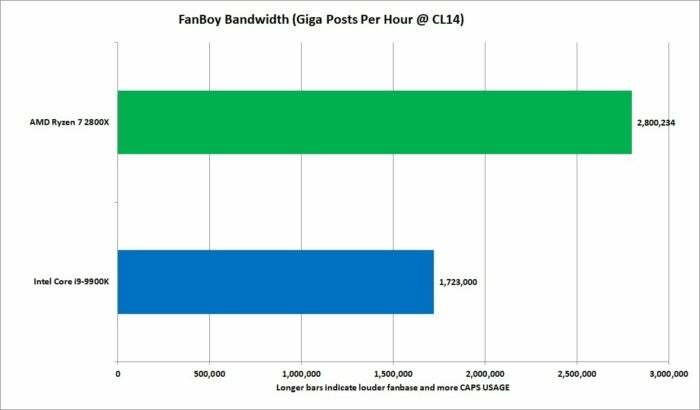 FanBoy Bandwidth is gathered by querying Google, Bing, and Ask for search-related terms around a certain new product or brand. That’s all correlated with how often fans will post to individual forums asking about the new chip or what to build around the new chip. All told, a made-up survey of network providers found that PC search-related terms and forum posts accounted for two-thirds of Internet traffic in 2018. Netflix, Torrents, and YouTube took up the rest. This anecdotal evidence gives the edge to AMD fans, who think, post, and wear T-shirts emblazoned with “Ryzen” more than all Red Sox, Yankee, Bulls, Warriors, Lakers, and Patriots fans show their team colors, combined. While there are actually more Intel fans, they just don’t have as many T-shirts or hats. Although there are fans on both sides, an unscientific, anecdotal examination of forums, YouTube, Reddit, and blood pressure data still gives AMD the critical mass. We used to rely on Shades Per Triangle to measure how much venom and bile were spat at particular CPUs. 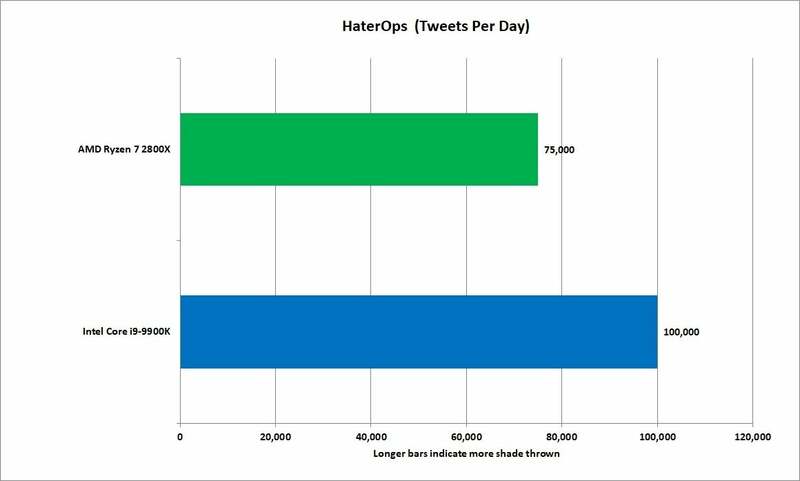 We’ve since moved on the more general purpose HaterOps benchmark. This benchmark measures how much vitriol is directed at a particular CPU architecture or brand (or even box). Don’t confuse this with the unoptimized FanBoys benchmark, because not all are haters. The good news (or bad) is that the haters do it well enough for all of us. One key difference is haters must always talk past your argument and deflect with a fact unrelated to the discussion at hand. 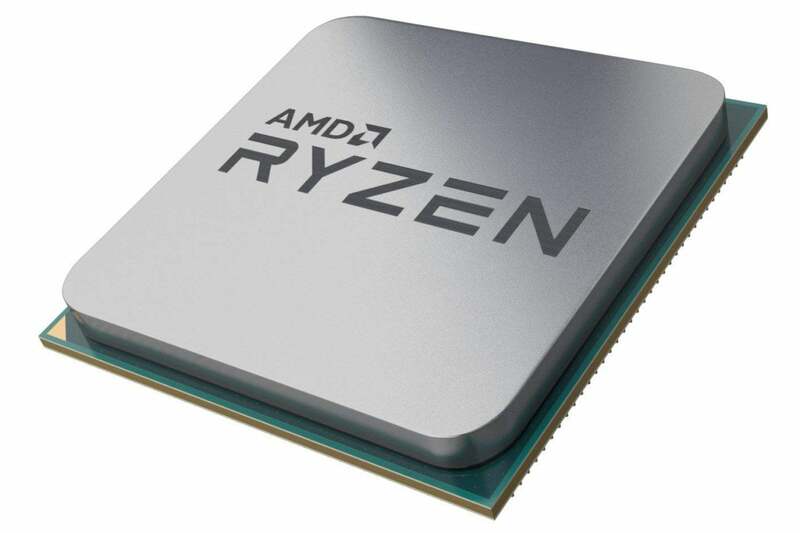 While AMD’s Ryzen 7 2800X gets hate for being a Multi-Chip Module (MCM), or for its chip-to-chip latency, the reality is that being the bigger brand and selling more CPUs means you get more hate. 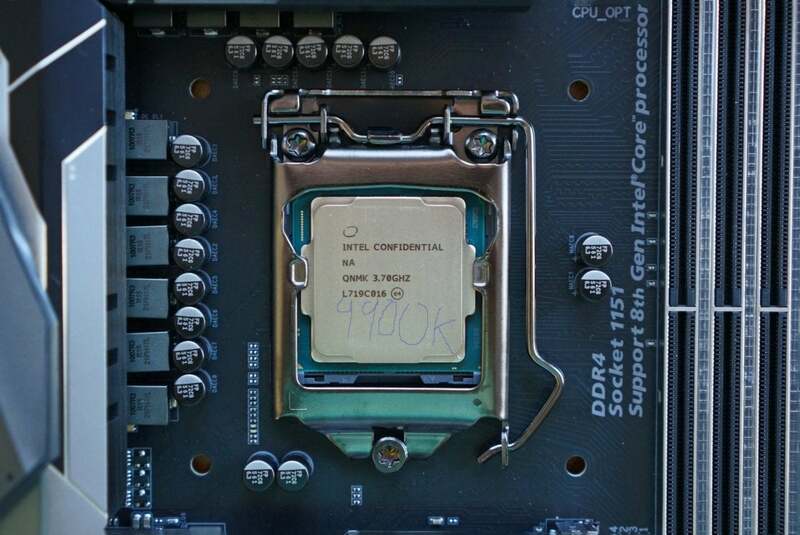 So, whether it’s for pricing, segmentation, Hyper-Threading, features, socket, sins of the father, or the color of the socks people wore the day they purchased their Core i9, the Core i9-9900K definitely gets a ton more hate thrown its way. Not everyone on the Internet is a hater, but the ones that do make it up for everyone else. We could all wait for real CPUs to ship and then balance results from reviewers, customers, and OEMs to draw a conclusion. 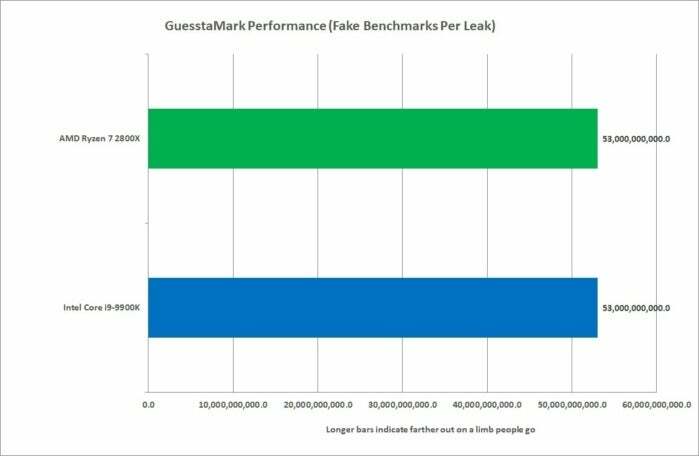 But rather than wait forever for hard facts, we turned to the ever-reliable GuesstiMark to tell you which CPU is faster. Some snobby elitists would disavow GuesstiMark because it’s not based on real tests, but rather three random entries in a benchmark database from Fakestan, but we disagree. It’s far easier to use scientifically-proven guesstimation to measure CPU performance. The only weakness with GuesstiMark is its temporal mechanic limitations. That is: The latest leaked benchmark usually is faster. For example, a leaked benchmark on Monday will show the Core i9-9900K to be faster. But a leaked result from Tuesday will indicate the Ryzen 7 2800X to be faster. How can these two be correct? Easy: The newest benchmark leak result is always the most accurate. So if you want to see which CPU is faster, the indisputable results are spelled below. 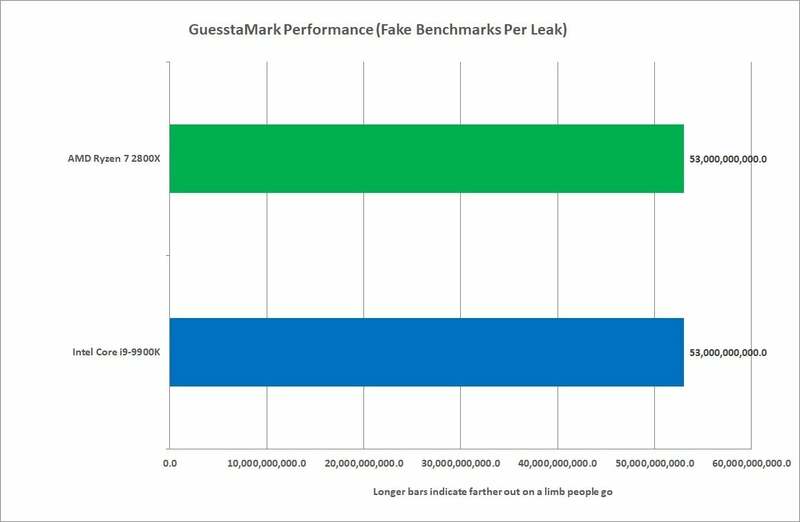 Guesstimark is used in High Performance Computing, AI, Machine Learning and budget phones to make totally bogus guesses on who will win. What purpose does trafficking in hype and innuendo serve? As badge-carrying members of the tech media, we have no idea why you would click on a story with a headline of Best Ryzen 7 2800X vs. Best Core i9-9900K: Best benchmarks revealed! Instead, what we have relied upon for many years is the rock-solid HypeBench. It measures all media mentions of CPU launches in print, online, offline, broadcast, Youtube, LiveLeak, newsletter, pamphlet and Gopher Hyperlinks, comparing the hype level to media coverage of sliced bread and solving world hunger. While it might be considered close, HypeBench clearly puts the Core i9-9900K ahead of the Ryzen 7 2800X by a pretty large amount. I mean, just look at the bar chart. 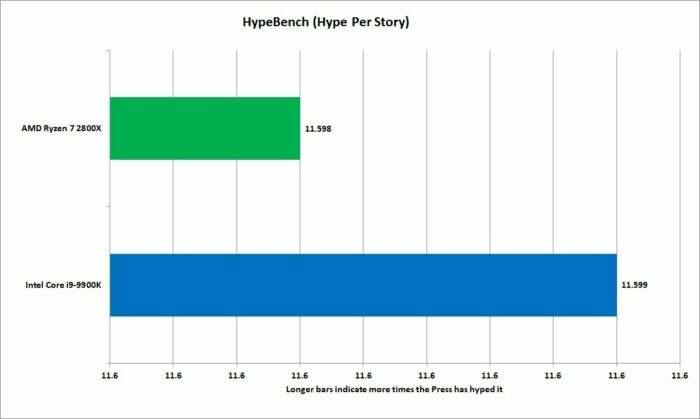 HypeBench 2.0 accurately measures how much hype the press has put into each product. Notice just how long the blue bar is, which means one is a lot hyper. With so much evidence, we now have irrefutable evidence that _____ is faster. With a price of _____ many will balk and many will celebrate. But _____ has pulled off an amazing victory here. It’s going to be hard to see _____ coming back from such a loss. Clearly _____ is the winner here and _____ deserves all the credit. Sources have confirmed that if there is a Ryzen 7 2800X, it will be a metal, square shape with pins on one side. It’s also confirmed it will say AMD and Ryzen on it. It’s all but certain it will cost money, too.